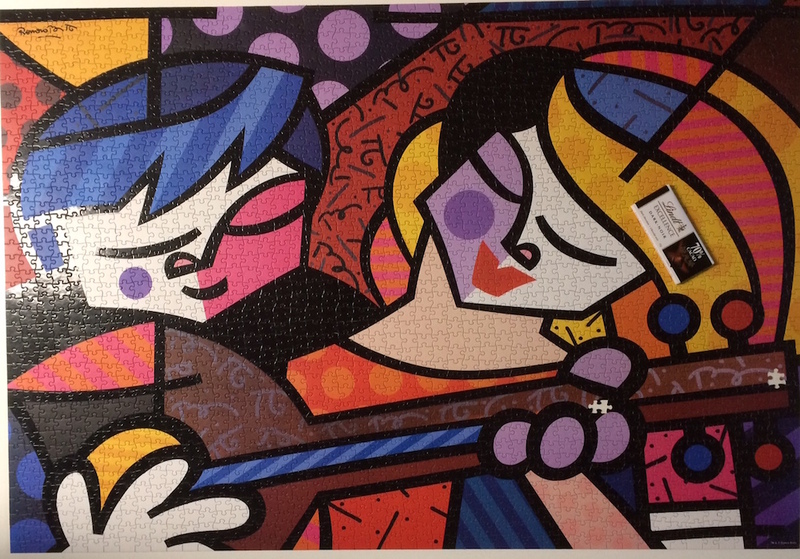 The Britto jigsaw puzzle, For The Two of Us was sealed and missing two pieces. After a very challenging experience it was disappointing. 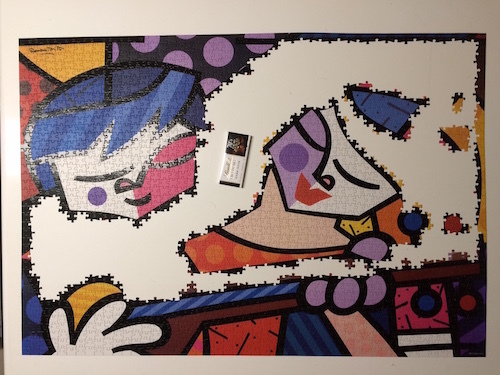 The pieces were thin and kinda snappy. 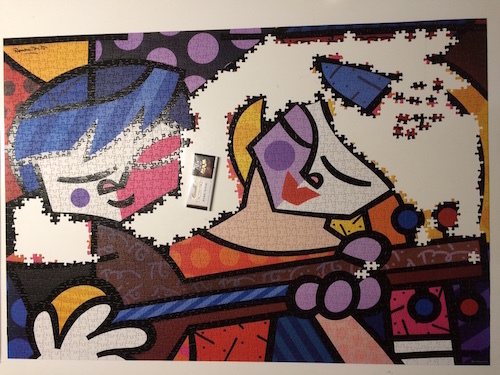 They were cut loose making it really challenging to move sections of pieces to other areas. 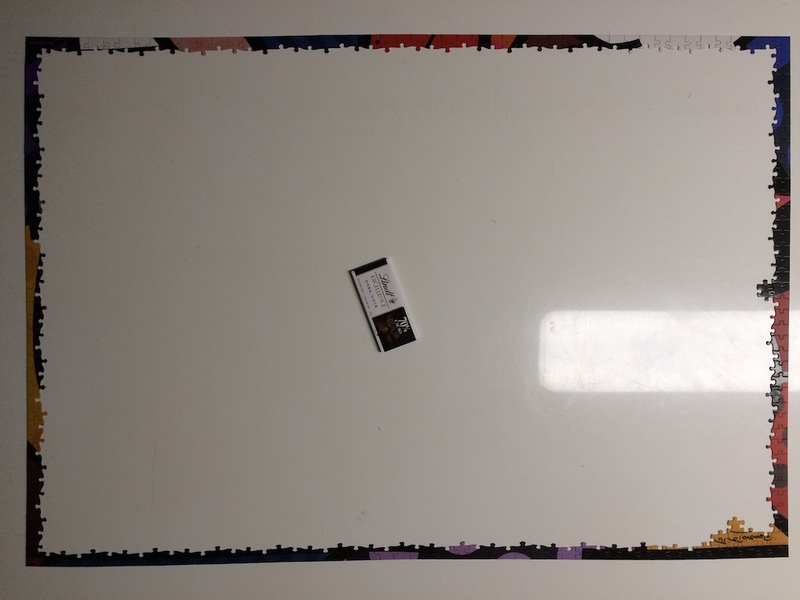 With so much solid colors and very little variations in the pieces the border and large dark section were quite challenging. 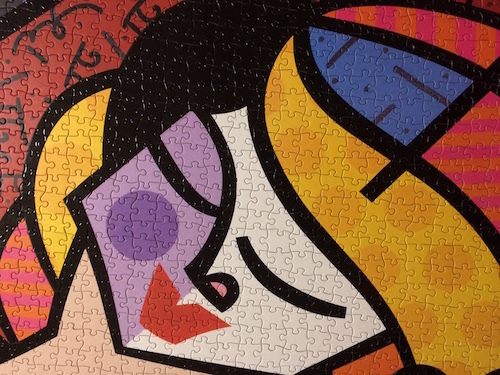 This Britto jigsaw puzzle is now my 2nd most disappointing experience in my hobby. Even though the colors are great and I love the image. 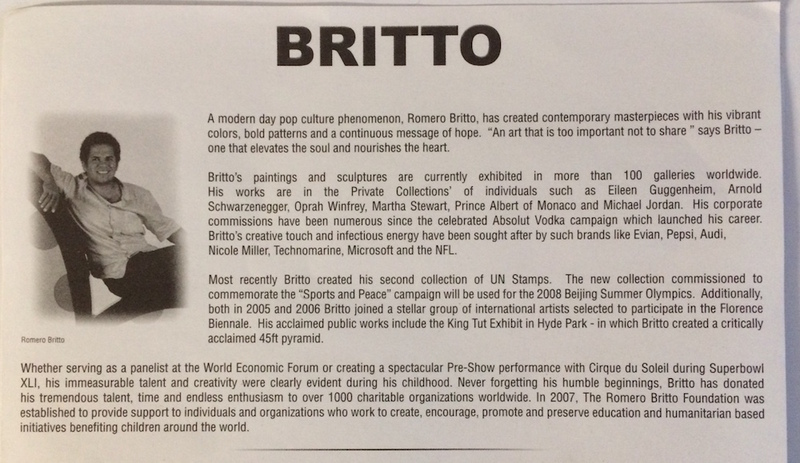 I have always been impressed with the artwork of Britto however I will have to be mindful of the Brand I purchase the next time. I researched the Sure-Lox company to discover the brand is produced by The Canadian Group. 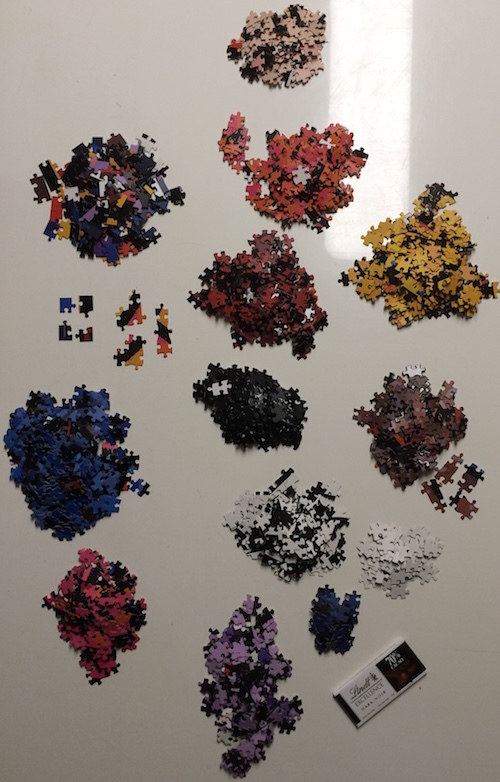 In my opinion, The Canadian Group/Sure-Lox are equivalent to the same company as Lafayette Puzzles in the USA which produces the same low quality as Puzzlebugs. 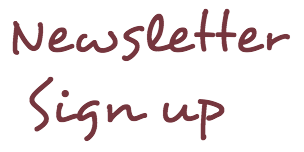 I located the following information which has a link to the website that list several other jigsaw puzzle companies. 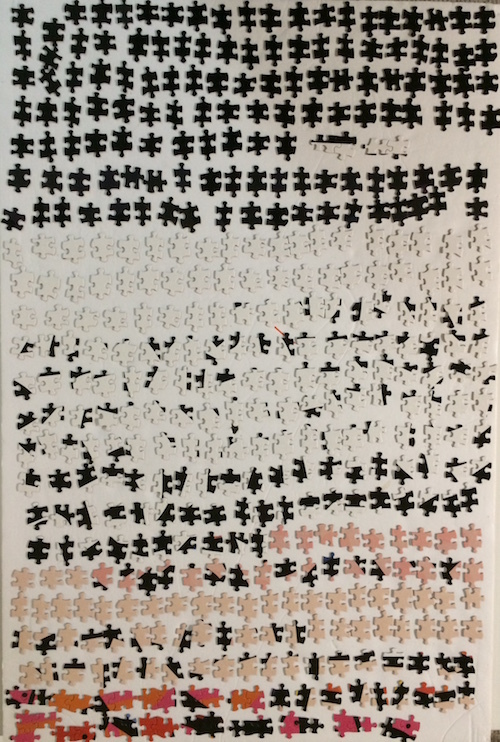 The Canadian Group is considered to be the fastest growing puzzle company in the United States, Canada, Australia, The United Kingdom, as well as in over 40 other countries around the world. 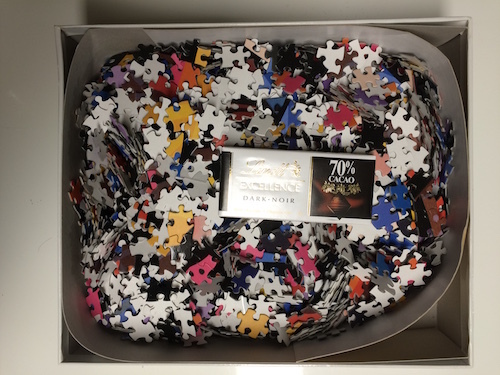 Founded nine years ago, the company's focus is to provide trend conscious products of exceptional quality at amazing retail prices through its Sure-Lox® brand of jigsaw puzzles. Each year the collection of images captures the beauty of the world we live in, both illustratively and photographically. 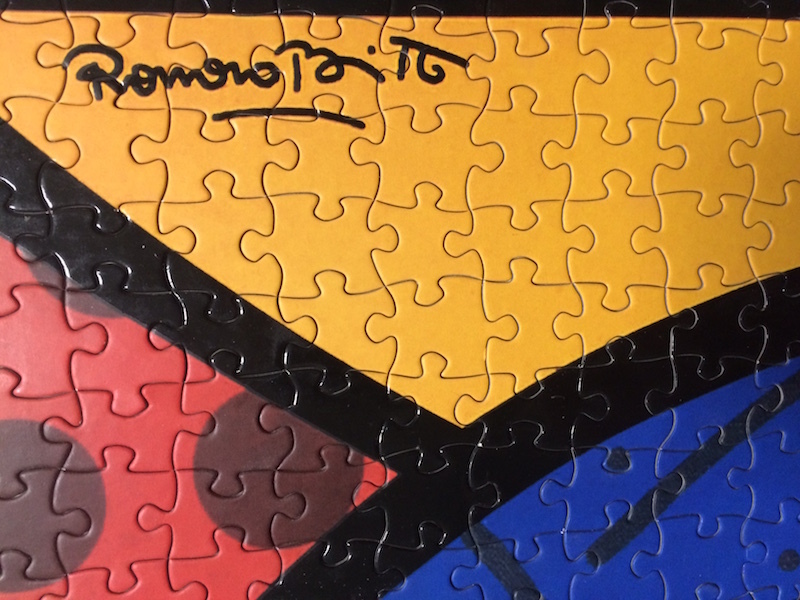 The Canadian Group focuses its resources on developing and promoting established and sustainable brands and is proud to present Planet Earth™ - The Jigsaw Puzzle Collection™ and welcome Barney into our collection of friends. 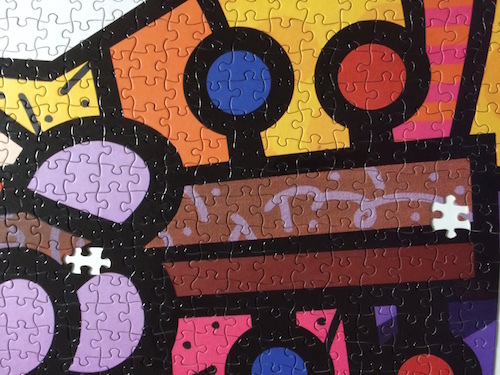 Planet Earth™ and our Barney jigsaw puzzle collections are, and will be available at most major retailers of jigsaw puzzles on planet Earth. 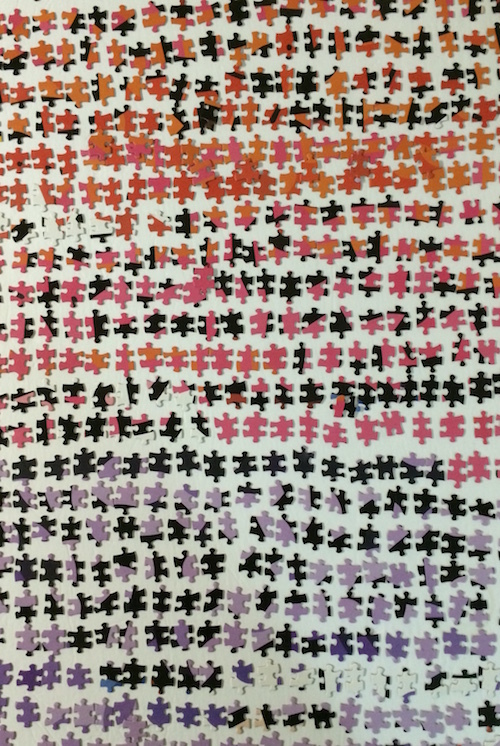 After the border, the first area was the smaller solid colors areas like the signature. 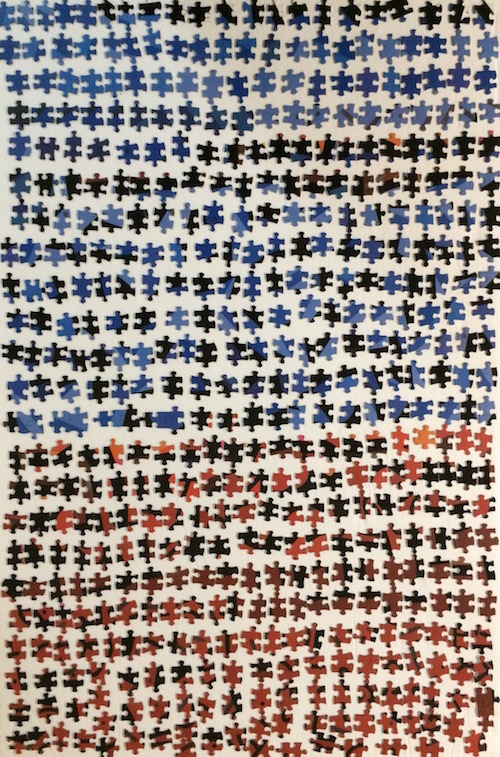 Then I worked the boy, the girl and the musical instrument. 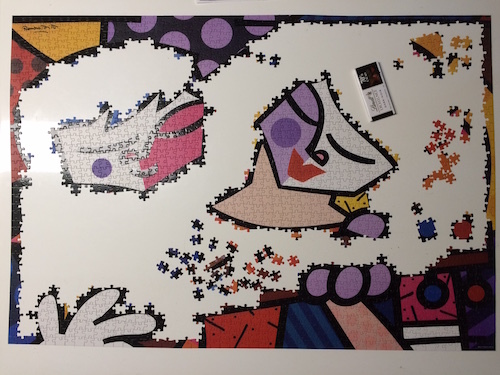 I finally worked the backgrounds but the overall puzzle was really challenging to do. Sadly there is 2 missing. 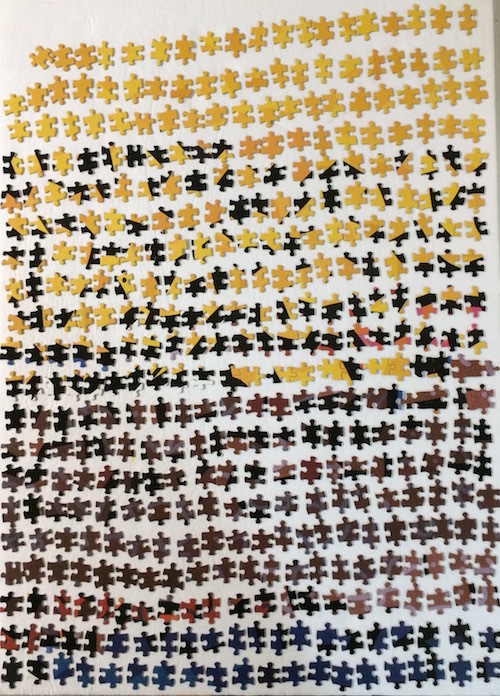 The box was sealed so that rules out losing any piece that way. 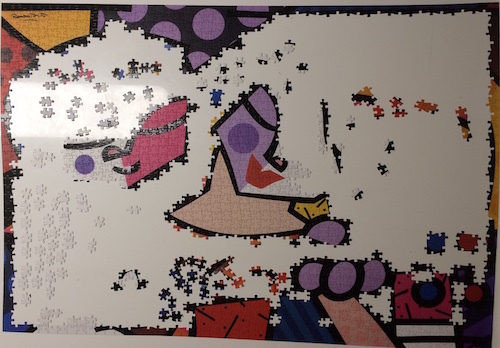 We were very careful not to lose any pieces and did scour all over to find the missing pieces but no where to find them. 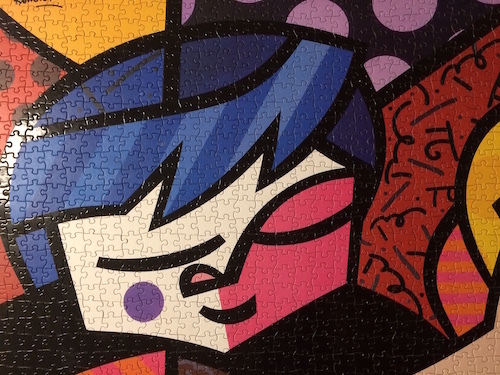 As I said, I really wanted and now after assembling this one with 2 missing pieces and the poor quality, I still do. 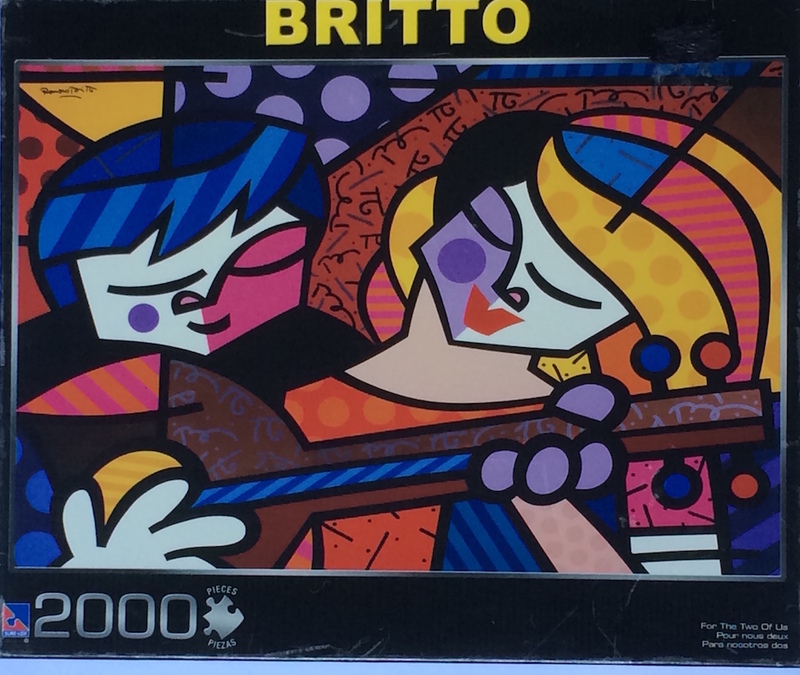 I will not be keeping this very low quality brand of Britto and I do not recommend it to any puzzlers.